Although nonsurgical treatment options like medications or using crutches can relieve pain and slow the progression of the disease, generally treatment is surgical. 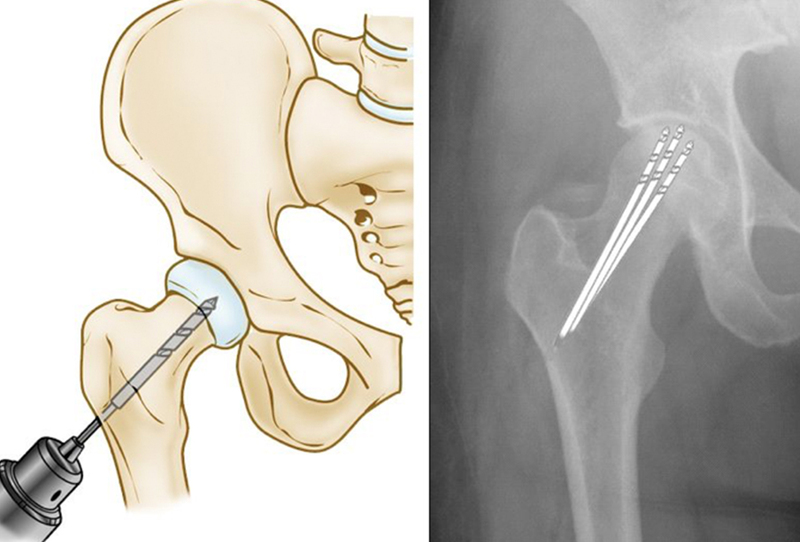 Patients with osteonecrosis that is diagnosed in the very early stages (prior to femoral head collapse) are good candidates for hip preserving procedures. (Left) Core decompression. (Right) In this x-ray, the drill lines show the pathway of small drill holes used in a core decompression procedure. 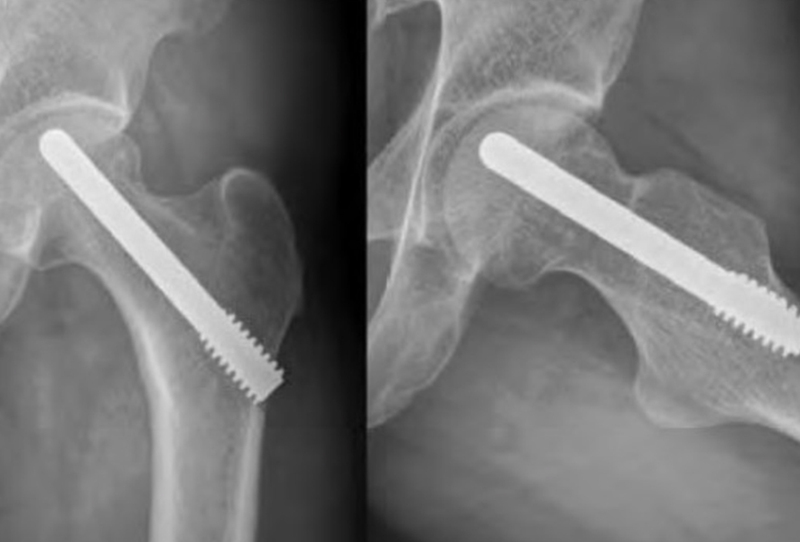 In certain cases which are detected early, Mr Slattery can use a specialized Tantalum (a type of metal) rod to prevent the femoral head collapsing, and prevent a total hip replacement. Another surgical option is a vascularized fibula graft. This is a more involved procedure in which a segment of bone is taken from the small bone in your leg (fibula) along with its blood supply (an artery and vein). This graft is transplanted into a hole created in the femoral neck and head, and the artery and vein are reattached to help heal the area of osteonecrosis. If osteonecrosis has advanced to femoral head collapse, the most successful treatment is total hip replacement. This procedure involves replacing the damaged cartilage and bone with implants. 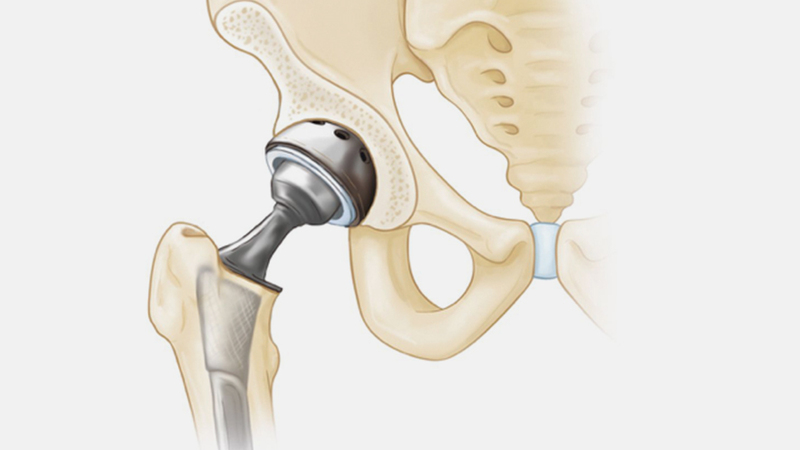 In a total hip replacement, both the head of the femur and the socket are replaced with an a prosthesis. When osteonecrosis is diagnosed after collapse of the bone, core decompression is not usually successful in preventing further collapse. In this situation, the patient is best treated with a total hip replacement, which relieves pain and restores function in over 95% of patients.